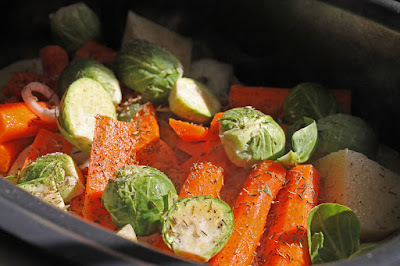 During the fall and winter months, I find I use my slow cooker about once a week. The slow cooker is a convenience kitchen appliance for me, not my preferred cooking tool. There are those days when a "set it and forget it" approach to meal preparation works for busy families. I plan my weekly meals so that on my busiest days the slow cooker gets drafted into action. 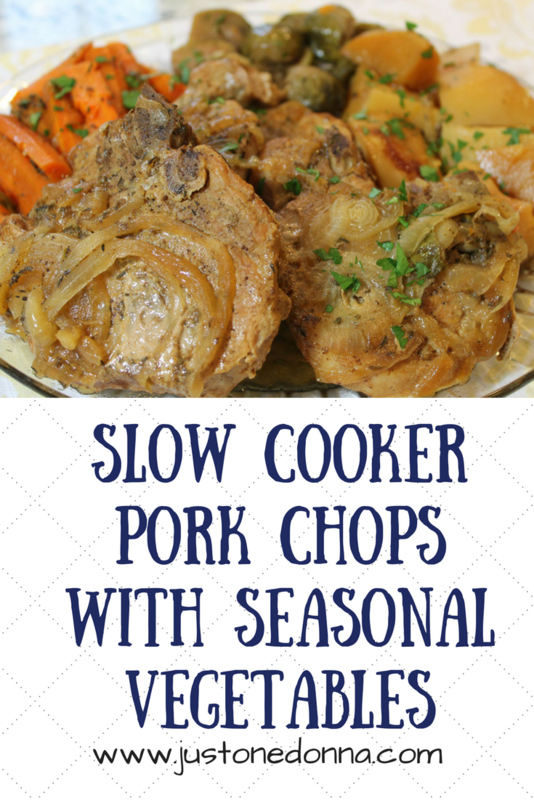 This recipe for slow cooker pork chops with seasonal vegetables is in my regular menu rotation for the busy days. A key to success with this recipe is selecting the right pork chops. A bone-in pork chop works best. You'll find that bone-in pork chops have the best flavor and texture when cooked in a slow-cooker. This recipe truly is a one pot meal. 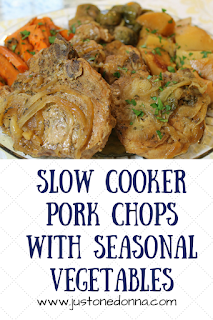 The pork chops and vegetables are all cooked together in the slow cooker. I'm lucky to have a slow cooker that has a stovetop setting, allowing me to brown the pork chops in the slow cooker and not having to use a separate frying pan for that step. This makes the recipe perfect for those busy days because preparation is easy and clean up after dinner is a snap. There are a few things you should keep in mind when planning your slow cooker meal. Select the right cut of meat for your recipe. Be sure to fill your slow cooker two-thirds full. Don't peak. Every time you lift the lid you will add twenty-thirty minutes to the cooking time. Keep the size of your vegetables consistent. Include at least one cup of a flavorful liquid in the recipe. This recipe uses a 6-quart slow cooker. Season the pork chops with salt and pepper. Heat the oil in your slow cooker or a frying pan. Brown the pork chops on both sides, about ten minutes. Position the pork chops evenly in the slow cooker. Distribute the onions evenly over the pork chops. Add the vegetables to the slow cooker on top of the pork chops. Sprinkle the dried thyme over the vegetables. Pour the beef broth into the slow cooker. Cook on high for 4 hours or low for eight hours. To thicken the gravy before serving: Make a slurry with two tablespoons of all-purpose flour mixed with 1/3- 1/2 cup of water. 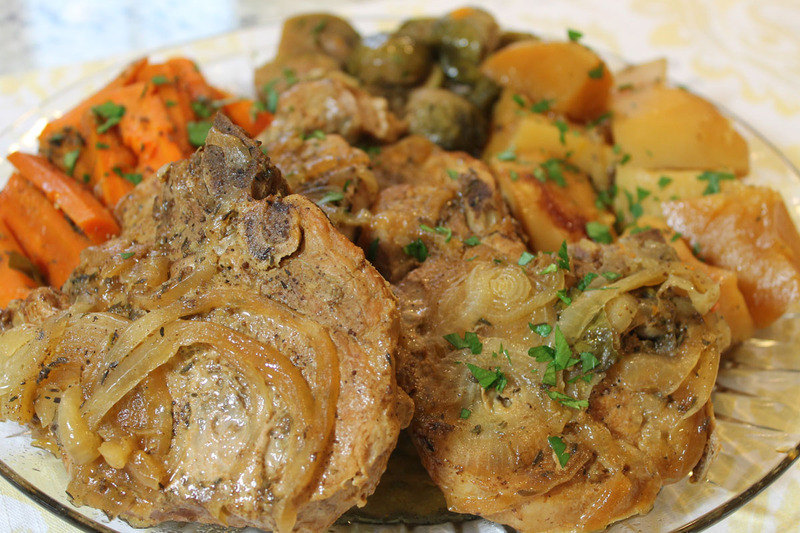 Remove the pork chops and vegetables from the slow cooker. With the slow cooker on high, add the slurry to the pan, stirring constantly. Only add as much of the flour mixture as you need to get the gravy to thicken. Let it cook for a minute or two. Taste and season with salt and pepper, as needed. Sprinkle with chopped fresh parsley. Before you go...Join the Just One Donna community by signing up for periodic emails with exclusive content. Sign up in the sidebar to get notified of new posts via RSS feed.